Here’s how you sign up for Setmore Live Booking. Before getting started, you should have already signed up for and set up a free Setmore account. At this time, you may only sign up for Setmore Live Booking from either the Setmore local app, or the browser version; we will add support for Setmore Live Booking from both the iOS and Android apps at a future date. Live Booking is currently only available in the US and Canada. If you aren't currently located in either the US or Canada, you most likely won't see the signup screen in your Setmore dashboard. If you are not from a supported country, you can still request to sign up for Setmore Live Booking. We'll consider these requests on a case-by-case basis. To request access, send an email to vijay@setmore.com. Click on the “Products” shield icon in the left navigation menu. Click the “Get Started” button for Setmore Live Booking. A details menu will appear and give you additional information. Click “Activate” to proceed. Enter your payment card information and submit to complete signup. Once payment is confirmed, you’ll receive your unique Setmore Live Booking phone number and we can start taking calls immediately. 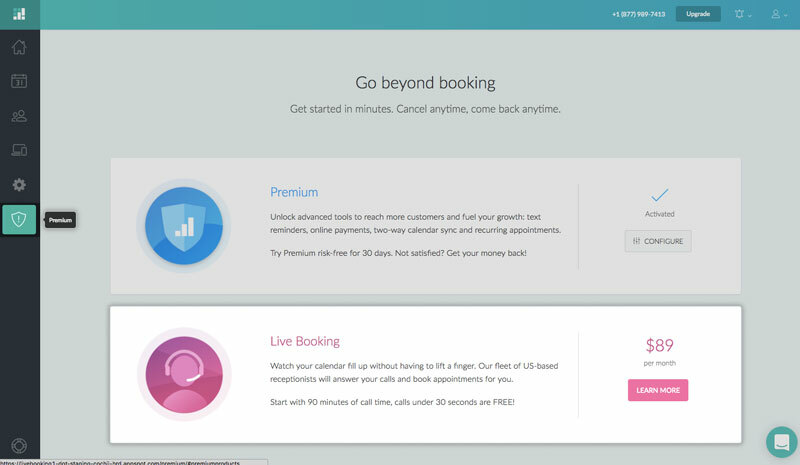 The Setmore Live Booking window will prompt you to make a test call. Simply call the number and a Live Booking receptionist will answer the phone on behalf of your business. You can either play along and watch an appointment get booked on your Setmore calendar, or you can indicate to the receptionist that it was just a test call. If you’re not satisfied with the experience or it was confusing, you can schedule a 1:1 follow-up session with a Setmore expert. A window will appear in-app, inviting you to book a session. Your Setmore Live Booking receptionist can now book appointments or take messages on your behalf. You can either use your Live Booking phone number as your business’s phone number, or you can forward calls from your current business phone number to your Live Booking phone number. It’s up to you.